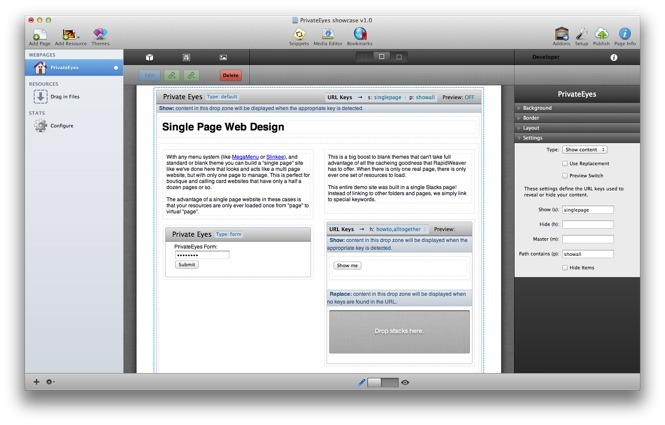 Obfuscate and protect your RapidWeaver websites. Is there a better alternative to PrivateEyes? Is PrivateEyes really the best app in HTML category? Will PrivateEyes work good on macOS 10.13.4? PrivateEyes is an amazing, simple-to-use, yet very powerful tool that lets you keep content and clutter under wraps--not just to the viewer, but in the source code as well. This allows for many possibilities, including keeping your content private, making page loads more efficient, simplifying small site design and much more. Fixed an issue introduced in the last release, where an update loop could occur even after having the latest version installed. PrivateEyes needs a review. Be the first to review this app and get the discussion started!